May 2017 was an interesting yet trying time for the team of Marine Dynamics and the Dyer Island Conservation Trust. 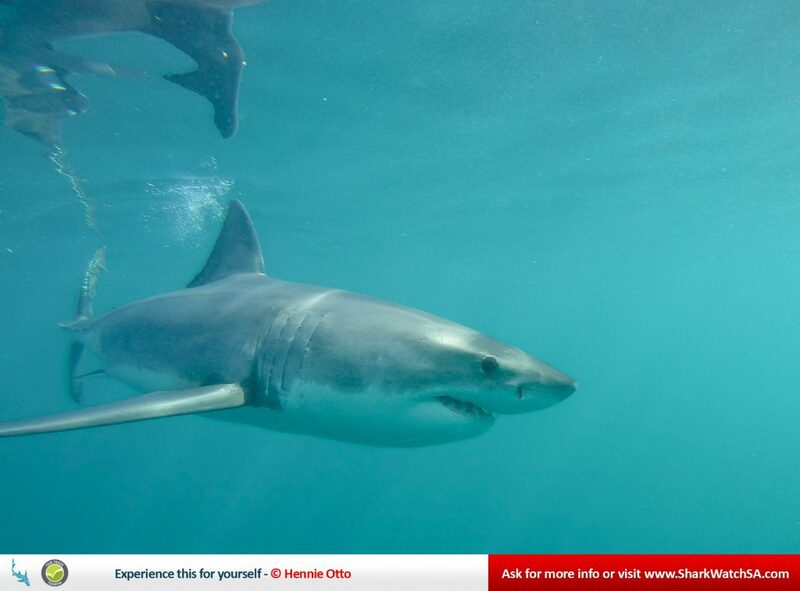 The team was called out to retrieve not one but three white sharks – female of 4,9m and two males at 3,6 and 4,5m. All three sharks have been identified from our extensive database. 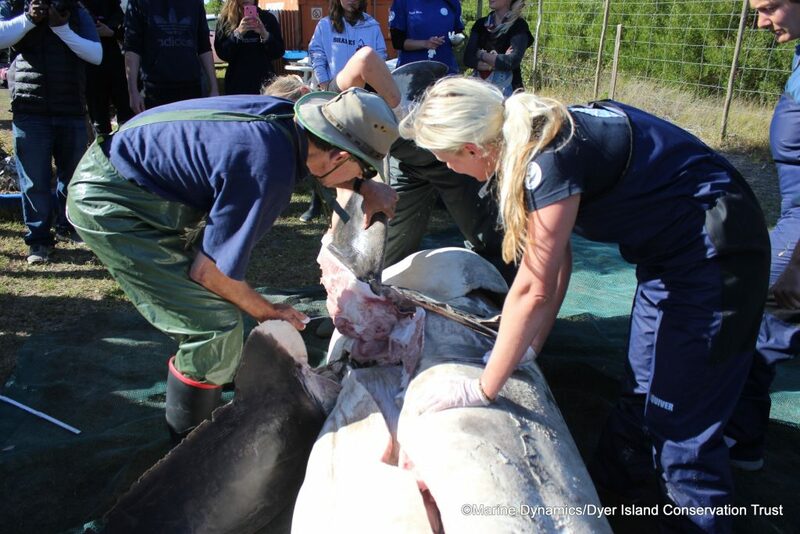 Shark biologists, Alison Towner and Kelly Baker assisted by the team and experts in their field including Dr Malcolm Smale, and with the permission of the Department of Environmental Affairs did the dissections on site in Gansbaai. All three sharks had consistent bite wounds and were found to be missing their livers. This indicates what is known of orca predation on sharks as they attack and stun the shark into tonic immobility and the buoyant liver rises to the surface through the injury. The squalene rich liver is the only part that the orca’s appear interested in although the one male shark was also missing a heart. The orca (Orcinus orca), also known as the killer whale, belongs to the dolphin family and is the only know natural predator of the very legendary apex predator, the great white shark. 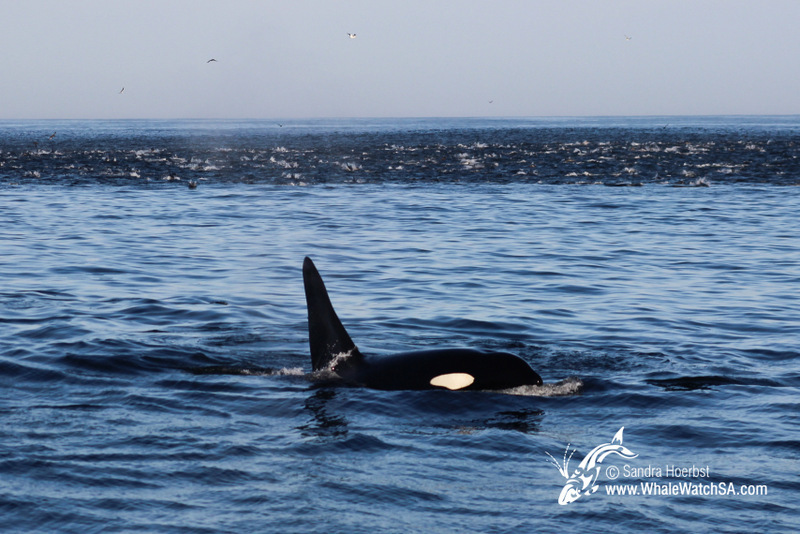 In the last two years there have been more frequent sightings of Orca in the Gansbaai area. There has always been speculation as to how the orca’s affect shark behaviour and this is confirmation that some orca’s do indeed pose a serious threat to the already vulnerable population of great white sharks on the South African coastline. This is the first time worldwide that a white shark has been dissected after an orca predation and this is the first official observation of orca predation on white sharks in South Africa. Predation on seven gill sharks has been confirmed off Cape Town, New Zealand and South America. Internationally, orcas have predated on white sharks off the Farallon and Neptune Islands (known white shark aggregation sites off California and Australia) and while footage of the predations exists, due to the offshore location of both areas no carcasses were available for autopsy. 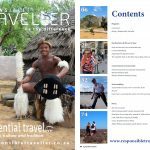 The Dyer Island ecosystem is complex and delicate and the white sharks are a very necessary apex predator in the region helping in keeping the abundant Cape fur seal population in check. 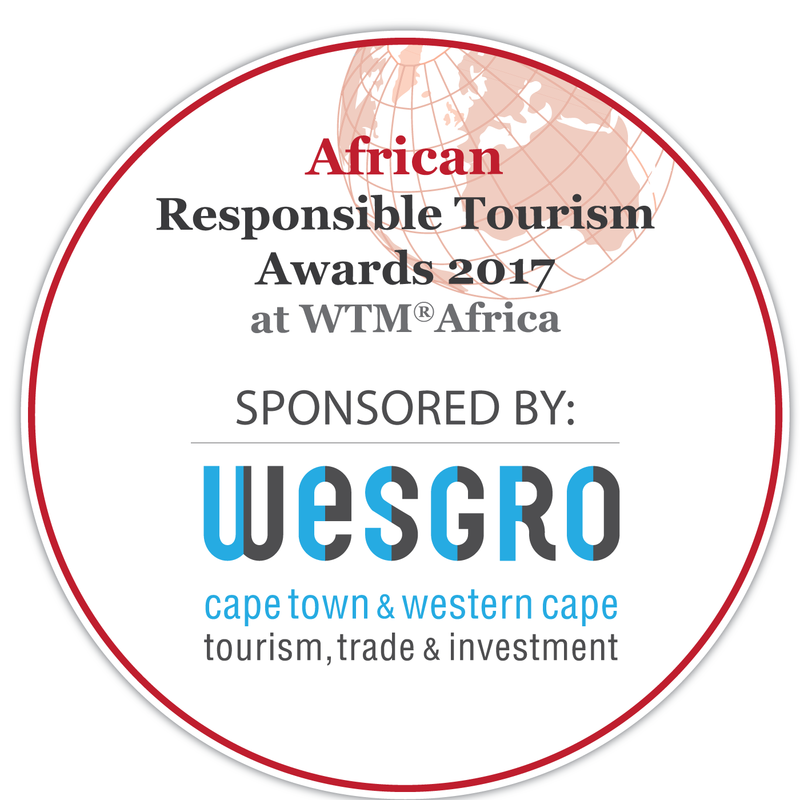 The great white sharks along the South African coastline are transient and can undergo lengthy migrations in between sightings. The Marine Dynamics/Dyer Island Conservation Trust team was called out in the early morning to retrieve a deceased white shark at the beach in Franskraal, Gansbaai. The Department of Environmental Affairs authorised the Dyer Island Conservation Trust team led by shark bologist, Alison Towner and supported by Dr Alison Kock. Shark expert Dr Malcolm Smale, was flown in from Port Elizabeth to lead the dissection. The dissection was a lengthy process. It is the biggest white shark dissected in South Africa. One major observation is that the shark was missing its entire liver indicating that an orca is quite likely responsible for this type of injury. 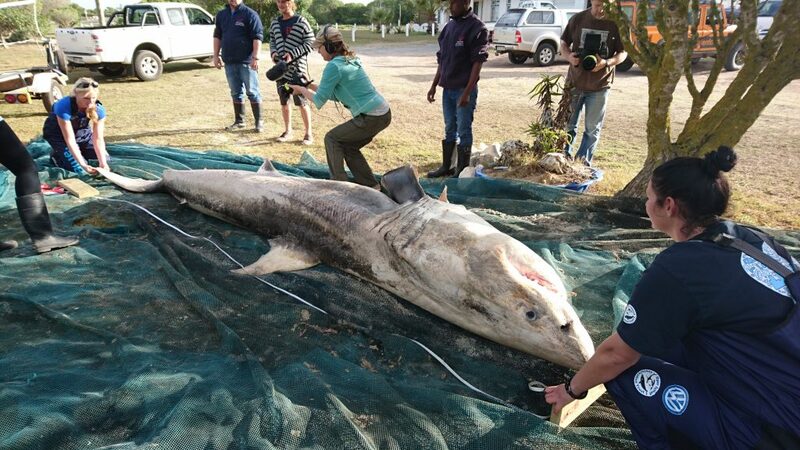 On the same day as the first dissection, another white shark was found on Franskraal beach. The team once again recovered the 3.4m male who is missing big pieces out of each flank. The specimen is in a more degraded state and cannot be frozen and is scheduled for dissection the following day. The second male white shark to wash ashore in Gansbaai is also missing its entire liver and heart, again a near certain indication of an orca attack. Marine Dynamics guiding shark biologist, Kelly Baker, matched this shark as one she had photographed on the 29th of April 2017 inshore on the Joubertsdam reef. She was able to recognise the shark using markings on the lower caudal fin (tail). 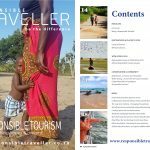 Dyer Island Conservation Trust’s Alison Towner says: “Today’s necropsy will be quicker than the 4.9m female yesterday due to the mutilated state of its body and missing organs,and many measurements will not be possible. This is a difficult yet fascinating time. Something rarely documented in marine top predator behaviour in South Africa,” says Towner. 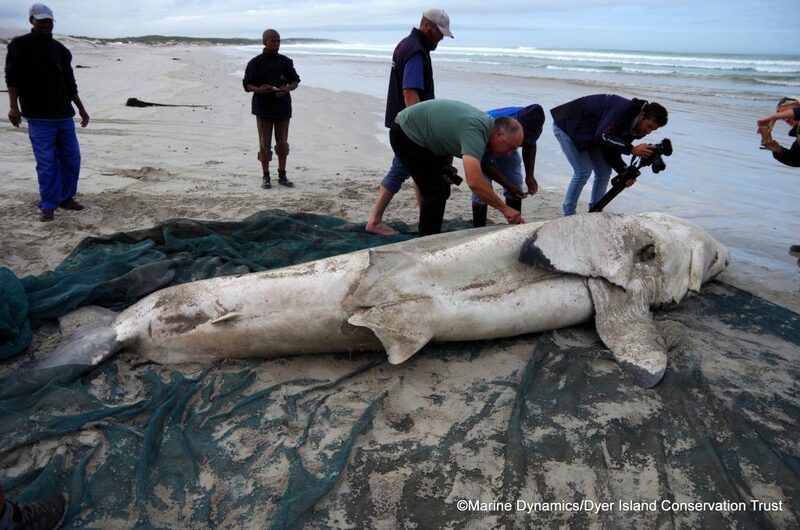 A third deceased white shark washed ashore, this time in Struisbaai. 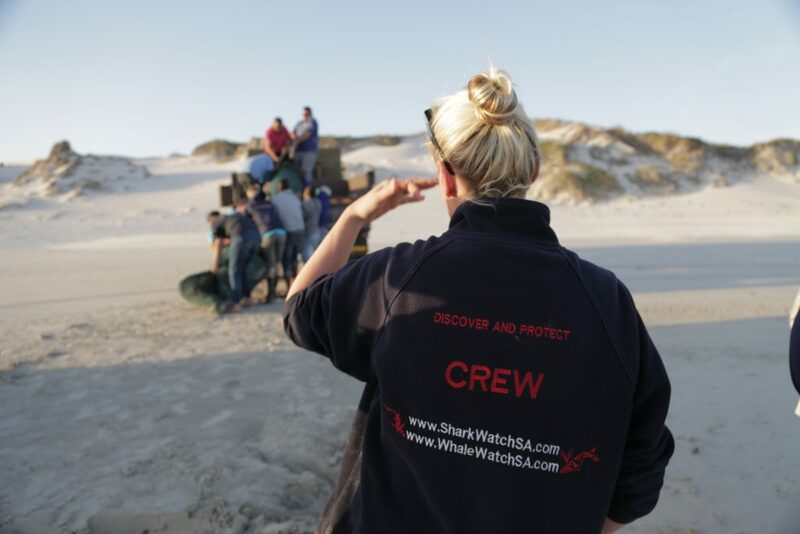 The NSRI site manager notified Dr Alison Kock and the White Shark Research Group. 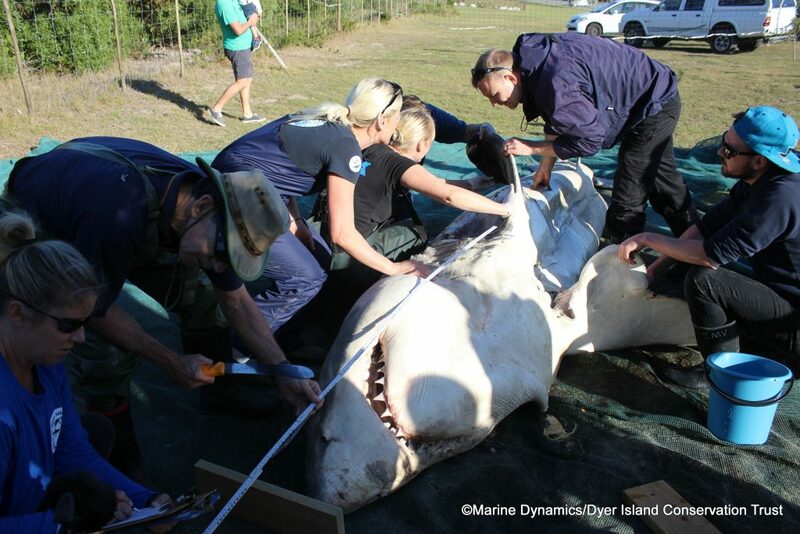 It was decided that the Dyer Island Conservation Trust team were the closest to the site and so they dispatched their team once again to go and retrieve the shark carcass using two 4×4 vehicles and a small vessel trailer. 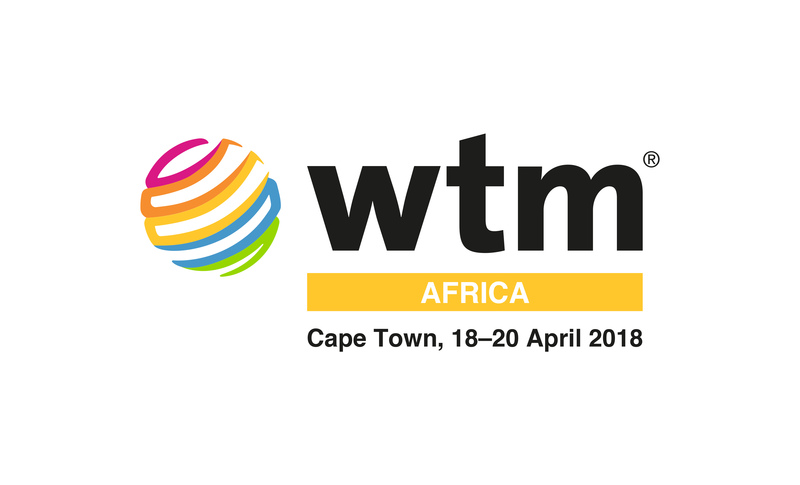 The team collected samples as required by members of the white shark research group in South Africa and Department of Environmental Affairs for a multitude of research projects. The necropsy began with extensive morphometric measurements to obtain accurate size information. Parasites such as copepods and nematodes are extracted and preserved, muscle tissue is preserved for genetics diet and physiology studies and all the wounds measured and examined closely. Vertebrae are collected for age growth studies and all organs are inspected weighed and measured. The team have worked tirelessly this past week and feel satisfied that they have collected a vast amount of very useful samples to improve our knowledge of this species in SA. They concluded that all three white sharks were killed by Orca via the removal of their livers. Not one shark had an acoustic transmitter so they were identified on the Marine Dynamics database by Kelly Baker using their dorsal and caudal fin markings. An Orca grows to about 9,5m so is a bigger contender than the great white shark, although the largest female predated on was an impressive 4,9m. Orca’s are known skilled hunters and will hunt in pairs or a pod making them no match for a solitary great white. However, as a mammal, Orca’s do need to surface breathe and cannot go to the depths that a white shark is capable of, making depth and exit the best strategy for a white shark.